Maximum performance on the race track! That‘s our motto since 1979. Since the mid-seventies WOLF has been active and successful in motor sports. As a support team to FORD they have contributed immensely to the rise and success of the FORD Racing Team in the 80s and 90s as well as the engine and car developemnt for rallye and circular racing tracks. Prices won and renown race car drivers who were part of the WOLF racing team confirm our work and philosophy ethics. This very spirit and the technical expertise are still part of the WOLF Racing products today. Highest quality and innovative technology „Made in Germany“ is our foundation. Even today we‘re building individualized cars for private racing teams. Just get in touch with us and lets talk about it. 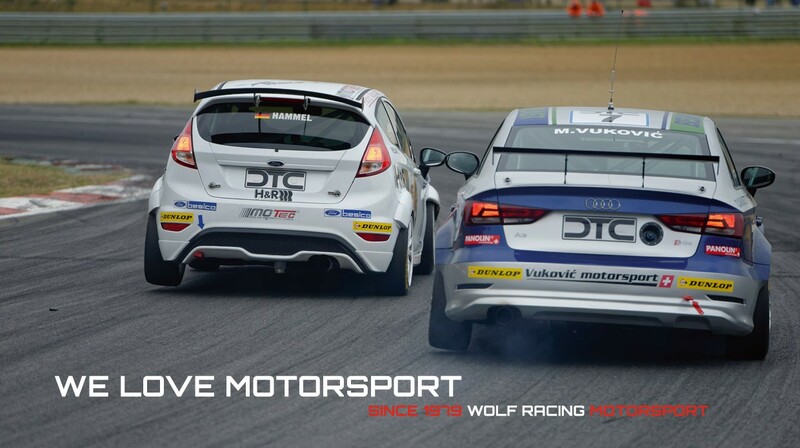 For almost 40 years WOLF Racing has been involved in the professional development, building and running of race cars, especially in touring & endurance racing. No matter what kind of engine, drive train or chassis: with our broad skills and our vast network of technical experts we can provide you with any suitable solution, just right for you. The right tuning of the suspension is the decisive factor in racing. Victory or loss? In finding the right suspension system together with you, our in-house suspension test team will develop the right combination of damping & handling ... to make you successful! To be highly competitive, a race car needs the right, rigid chassis. We‘re not only building the entire racing engine for you, but we also develop or revise the chassis in parts or as a complete version for you.